Four takes on the classic Green Beans Almondine. 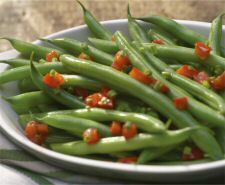 There is certainly no shortage of recipes for Green Beans Almondine. It's a classic dish that's easy and elegant. We've given you four different versions here. Our first version is the classic recipe. The second recipe calls for the addition of a bit of lemon for a French twist, the third add's tamari or soy for an Asian flavor, and the fourth recipe calls for the addition of one of our favorite veggies to pair with green beans, mushrooms. ** We've also given you a few tips about cooking and ingredients . Saute almonds in butter until lightly browned; do not burn. Steam the green beans. Toss with almonds and season with salt and pepper before serving. Cut beans French style and boil until tender. Combine butter and almonds over low heat until golden. Remove from heat and add lemon juice. Pour over drained beans. **We'd suggest that you never use anything other than FRESH lemon juice. We also think we'd consider using a bit less juice and adding a bit of lemon zest. Don't forget salt and pepper to taste. Wash green beans. Cut off ends. Slice or cut the way you prefer. Steam until just done. Saute garlic in olive oil. Add almonds. Toss green beans in this mixture to coat. Add tamari or soy sauce to taste and serve. **Soy vs tamari: Soy is best for everyday cooking such as stir frying or seasoning vegetables, as it harmonizes and enhances without overpowering. Tamari, with its stronger flavor, is traditionally used to season longer cooking food such as soups, stews, and baked dishes. Prepare beans for cooking. Simmer in small amount of water for 10 minutes. In skillet, saute mushrooms in butter until brown. Add salt and almonds. Add beans to skillet. Toss well, simmer 4 minutes. Correct seasoning to taste. **The secret to having mushrooms "brown" is not adding salt while cooking them. When you add salt the mushrooms give off water and don't brown, so hold off on adding salt until you finish the dish.